Shawn Estes, the man whom Mets fans remember most as the guy who missed Roger Clemens with a beanball, has signed a minor league contract with the Los Angeles Dodgers. If Estes makes the Dodgers' 40-man big-league roster he'll be paid $550,000 and could earn an additional $1 million in performance bonuses bases on starts, from five to 30. The 35-year-old lefty had a 2-3 record with a 4.74 ERA in nine games for the San Diego Padres last season. For the 2002 Mets, Estes went 4-9 with a 4.55 ERA in 23 starts. 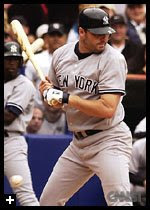 And although that record was pretty lousy, and though he blew the Mets sole attempt at revenge against Roger Clemens, he did beat the Yankees in that same game, allowing 5 hits and no runs in 7 innings, throwing 11 Ks en route to an 8-0 win. He also hit a homerun off the guy he was supposed to bean. Former Mets pitcher Dave Roberts, a left-hander who also played for the 1979 World Series champion Pittsburgh Pirates, died of lung cancer Friday. He was 64. Roberts had a 13 year career in the big leagues, amassing 103 wins for eight teams, but finished his career with seven appearances for the 1981 Mets. "I went over to the Mets with something in mind, to win a World Series in the National League, and I haven't achieved that,"
"I'm anxious to get out there with the team that we have right now. We should be really close to a team that will win it all, and I want to be part of it." The Mets, according to various outlets, are open to bringing Pedro Martinez back on an incentive-laden contract. -3B Melvin Mora will play for Venezuela in the World Baseball Classic. -Chan Ho Park finalized his one-year, $2.5 million deal with the Phillies. -Lastings Milledge is competing with six other outfielders on the Expos', I mean Nationals', 40-Man roster for playing time. Milledge may lose his centerfield job, and may find himself shipped out of Montreal, I mean Washington, altogether. "The message that Heath has to understand is that nobody replaces a guy like Trevor Hoffman," Black said. "Nobody replaces that caliber of player. He has to be Heath Bell. He has to be what he is capable of doing as a major league pitcher. From what we have seen the last couple of years, we have to hope that translates into a guy who gets major league saves." Bell's teammate Chris Young echoed the endorsement that Bell will be great as a closer. "As much as we'll miss Trevor, hopefully we'll find a way to win games and find somebody who can get three outs to end the game, and we'll be all right. Trevor's value to the franchise has been a lot greater than that, but hopefully Heath will be up to the challenge." Boy, that sounds like about as much confidence as the Mets had in Bell when they traded him to San Diego for Jon Adkins and Ben Johnson in 2006. In case you happen to live in Buffalo, the Mets' new AAA affiliate The Buffalo Bisons announced today that ex-Mets All-Star and 1969 World Series Champion Ed Kranepool will speak at the team's Hot Stove Luncheon, Friday, January 16 at the Adam's Mark Hotel in Buffalo. Ed Kranepool is the Mets all-time leader in at-bats, hits, doubles, and total bases, playing more games as a Met (1853) than any other player. Ed Kranepool also played for the Buffalo Bison in the early 1960's. "When we buy a call option contract, we are essentially paying for someone to guarantee to sell us the stock at a set price and on or before a set date. Then when we sell the contract, we are giving someone else the right to buy the stock. That is our strategy, and it limits our risk to the amount we paid for the option." Pretty intense stuff from a guy who was best known for diving for balls and calling everyone "dude." After leaving professional ball, Lenny Dykstra made a decent amount of money is various investments, most notably a chain of car washes. Nowadays Lenny Dykstra manages Nails on the Numbers, a subscription service sold by TheStreet.com. Click here for a free trial to Nails on the Numbers. "Wilson will continue to rehabilitate from a right elbow injury, and as such won't be in big-league camp during spring training. That elbow injury limited the 35-year-old to three games over the past two seasons." Drafted by the Mets out of college, Vance Wilson is remembered best by Mets fans as Mike Piazza's back-up from 2001 to 2004. In 286 games with the Mets, Vance Wilson hit .254 with 17 dingers and 92 RBI, and had an on base percentage of .308. Those numbers, compiled over six seasons, would be a poor one full season for the guy he was backing up, but Vance was a more-than serviceable backup for Mike Piazza, especially in the category of throwing out base runners. 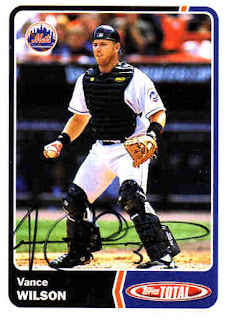 Vance Wilson became a transplanted ex-Met in January 2005 when he was traded to Detroit for Anderson Hernandez. Ex-Mets pitcher Claudio Vargas agreed to a one-year contract with the Los Angeles Dodgers yesterday. Vargas went 3-2 with a 4.62 ERA in 11 appearances, including four starts, in 2008 for the Mets. The St. Louis Cardinals have signed ex-Mets relief pitcher Royce Ring to a one-year contract, accodring to ajc.com. The Mets acquired Ring in 2003 when then interim-GM Jim Duquette dumped Roberto Alomar on the White Sox, as part of his job of cleaning up Steve Phillips' mess. Everyone was all excited about Ring because of his cool name and most importantly because he would enter games to heavy metal music, a sure sign that the pitcher is dominant. Well, the Mets eventually let him go to the Padres, along with the underappreciated Heath Bell, in exchange for the forgettable Ben Johnson and Jon Adkins. Since then he's played for the Braves and now the Cardinals. So there you go. For some reason, the Mets are very late in providing a printable 2009 schedule on their website. 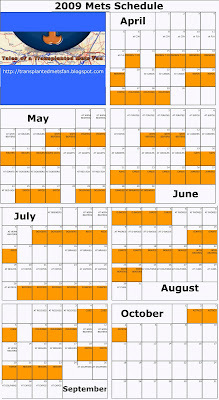 Usually at least a preliminary schedule is available pretty early in the offseason, but for now there is just a "sortable schedule" and a place to view games in each month. As we wait for them to release it, I threw together a printable version for your convenience. This is unofficial, and unapproved, so take it for waht it's worth... Click on it, save it, and print it. At some point I may get around to improving it, with game times, etc. but for now here's what I've been able to accomplish this weekend.